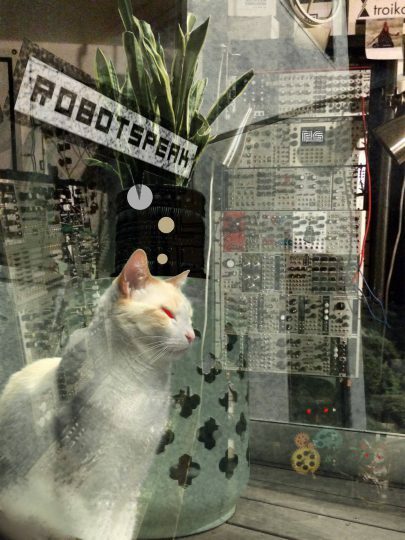 We espied this photo on the Facebook page of Robotspeak, our local synthesizer shop and informal gathering place for monthly shows here in San Francisco. I have myself dropped quite a bit of hard-earned money there (but don’t regret any of it), and I have played there on a few occasions, including the Analog Ladies showcases. You can read about past visits to Robotspeak via this link. The monthy Church of the Superserge event at Robotspeak in San Francisco has been going on five years. We at CatSynth were on hand to mark this milestone during the May show. Musically, the highlight was a solo set by Tom Djll on modular synth and mini trumpet. It was quite musical, blending rhythms and phrases with the timbral elements, even a “melody” of sorts from the processed trumpet. The afternoon opened with a set by Normalien, also on modular synthesizer. Some delightfully weird sounds with rhythmic elements. And Carson Day closed things out with a forceful set that included Novation and Dave Smith instruments. It’s always a fun afternoon at Robotspeak. Not only do I enjoy the music and technology in the performances, but also just browsing the display cases on the wall, seeing what instruments I should covet next. This little DIY synth stood out this time, especially juxtaposed between the giant vacuum tube and the WMD pedal. We look forward to next time, and perhaps playing again soon.